Back when I was living in Edinburgh I did a few trapeze courses at The Big Red Door. I kept meaning to find somewhere else to take lessons after it closed down, but I never got round to it. 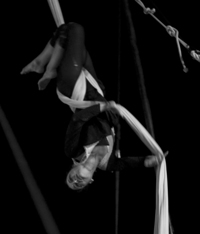 Eventually, yesterday, I started an aerial assortment course at the National Institute of Circus Arts in Melbourne. Boy, was it hard. It turns out I have got almost no upper body strength at all. I used to be able to do almost all the things that we were shown yesterday in the class but when I tried them myself I really struggled to hold my own body weight. The strength in my arms seemed to gradually deteriorate over the course of the evening so that by the time I got home, even pulling on my pyjama bottoms was almost impossible. I asked one of the teachers what I could do to practice. I was worried she was going to say press-ups (my worst nightmare) but she didn’t. She said to try hanging from monkey bars. I’m going to do it. There’s a park near my house where I can practice. That’s it; I’m determined. Even though I’m scared of getting chased away by a gang of school bullies. It’ll be worth it if only so that next week after class, I can get changed into my pyjamas without too much difficulty. 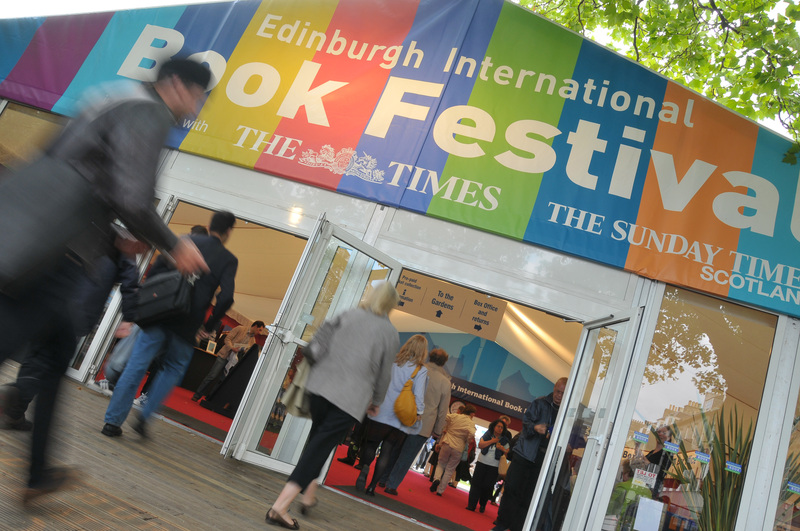 The Book Festivals – How can I express how absolutely amazing the Edinburgh International Book Festival is? I was bubbling with excitement the whole seventeen days of this year’s festival. Sometimes I felt my head would explode. Then there is the more intimate but equally exciting West Port Book Festival which brings together authors, readers and cup cakes in characterful book shop settings. Of course there are plenty more book festivals in and around Edinburgh but those two are my favourites. The literary and spoken word events – wine and gossip at the monthly Literary Salons, wine and talks at Edinburgh City Reads, wine and poetry at The Golden Hour. I go to these things for the literature, honest. The Art Galleries – In September I went to see Down Over Up, a Martin Creed exhibition at the Fruitmarket Gallery. The exhibition focused on things that went up or down in increments, for example, there was a row of cacti arranged in order of height, stacks of chairs with the largest on the bottom and the smallest on the top and sheets of A4 paper completely coloured in with felt tip pen wrapped around the wall in order of the darkest to the lightest shade. By far the funniest piece was the staircase, which had been tampered with so that the steps emitted a tone when you stood on them. With each ascending step the tone grew higher and higher so it was like you had your own personal cartoon soundtrack as you climbed the stairs to the next level. PLINK! PLINK! Plink! plink! Then last month I visited the Modern Art Gallery which is currently rotating its collection so that pieces that have been in storage for a long time are finally on display again. Robert Therrien’s giant table and chairs were hilarious. I was desperate to vault myself up onto the chair so that I could dangle my legs over the edge, but even if I had been able to get onto a chair, the seat of which towered above my head, I realised that I still would not have been able to see over the top of the table. I felt like a Borrower. I like modern art, I particularly like modern art that makes me laugh, and Edinburgh has plenty of both. The tea rooms – I overheard someone say the other day that there aren’t that many tea rooms in Edinburgh. Absolute nonsense. Check this out. And there are still loads more to be explored. The sky – look at my masthead. That’s an Edinburgh sky. Beee-ooo-ti-foool. The City of Literature Trust – All hail the wonderful Anna and Ali at the City of Literature Trust who are responsible for the above mentioned Literary Salon, Story Shop (my first paid writing gig, yay!) and the annual One Book – One Edinburgh campaign (among many other wonderful literary things). I cherish my beautiful Carry a Poem book which I got free as part of this year’s One Book – One Edinburgh. The Royal Mile – This is where you will find the oldest buildings in Edinburgh, huddled together like crooked teeth. The Royal Mile extends from the castle down to Holyrood Palace and is riddled with closes and alleyways. February on the Royal Mile is bloody baltic, but also clear and sharp glittery. It was on one of those February evenings that I realised that I really had to move to Edinburgh. 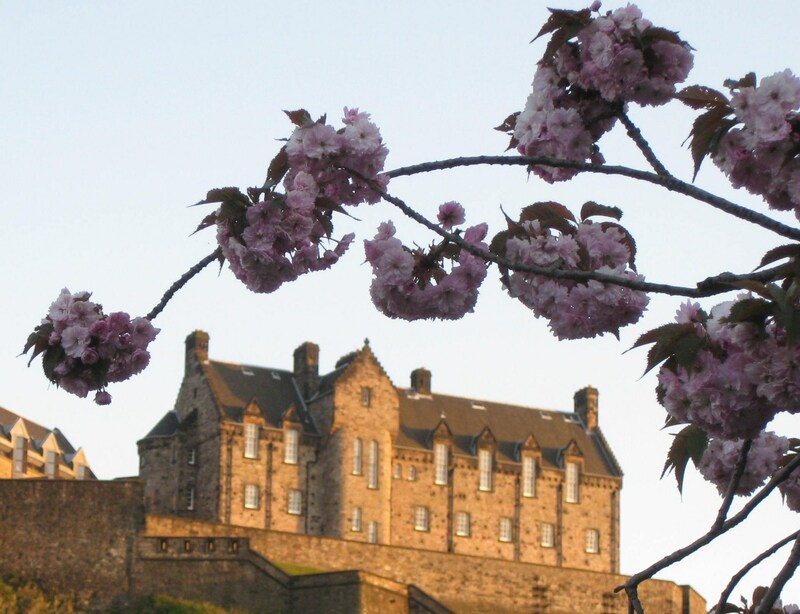 The castle – Edinburgh castle is like a village, a jumbled collection of buildings which you can easily spend all day exploring. From the grassmarket and Princes street it looks magnificent and imposing, particularly at night when it glows fiery orange. 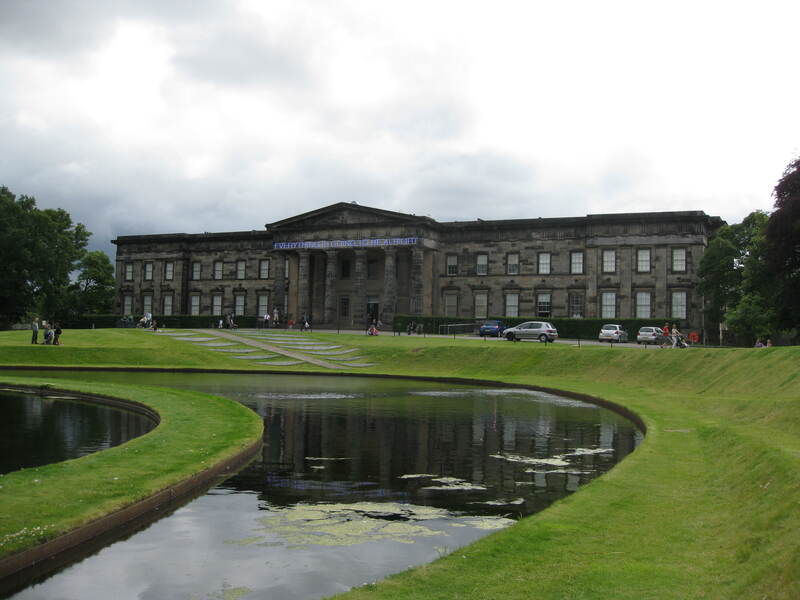 The libraries – There’s a copyright library, the university libraries, public lending libraries and the Scottish Poetry Library. A wealth of books, journals and magazines to leaf through. Leith – The first time I went to Leith was for a job interview. I was very surprised when the bus turned off a main road onto a cobbled street on the edge of the river. It used to be a separate burgh but now it’s been swallowed up by Edinburgh. A curious mix of very old and very new buildings makes Leith a charming and glamorous setting for a night out. It’s also at one end of the Water of Leith walk, a riverside stretch that takes you right across Edinburgh passing six Anthony Gormley statues on the way. I did that walk a few weeks ago but I only managed to spot two statues. I think I will wait for spring before I try to find the other four. The programme for the 2010 Leith Festival, which boasts 150 events in 50 venues within a 1 mile radius, is now available online. I am very very excited. There will be literary events, music, drama, dance, photography and visual arts and loads of other cool things all taking place between the 11th and 20th of June. Only 36 days to go! The Edinburgh International Science Festival will be taking place from the 3rd-17th of April with a wide range of events including talks, exhibitions and workshops. Visitors interested in crime fiction might enjoy the Rebus Tours: A Hidden Edinburgh and The Body Politic, or Murder, Mystery and Microsopes, a look at the application of forensics in investigating crime with crime writer Stuart MacBride. Following on from the very successful ScreenLab, Scottish Book Trust is teaming up with BBC Scotland to create CBeebies Lab. The Lab is free for successful applicants and is designed for anyone interested in writing television for a pre-school audience. Deadline 14th of April. The next installment of Edinburgh City Reads on the 15th of April will see Santiago Roncagliolo visit Central Library. Booking essential. During February there will be poetry events happening all over Edinburgh as part of the City of Literature’s Carry a Poem campaign. There will be opportunities to share your favourite poems with others, to attend poetry writing workshops and to take part in a treasure hunt. I see that Mark Thomson will be performing his poetry in Leith Library next Wednesday. I had an amazing time at a workshop with him last April and I strongly recommend that you go along if you can. From Monday 1000s of Carry a Poem Books will be given away for free in Edinburgh City Libraries. The book contains a selection of poems, each one accompanied by a story from the person who chose it to explain why that poem is significant to them. I’m desperate for a copy and am already planning the fastest route from work to the library on Monday afternoon. I’m sure the campaign will not only encourage people to read poems but also to treasure them. Already it’s got me thinking about poems that have meant a lot to me. I’ve never been a good one for memorising lines (I have friends who can carry on whole conversations quoting only from The Simpsons while the best I can manage is “Doh!”) and I’m not the sort of person who learns poems off by heart. I can’t claim to carry any one particular poem in my head, but there are some that still make me smile long after my memory of the words has faded. One of these is Fleur Adcock’s Illiterate, which I recently came across in a journal at the Scottish Poetry Library. The poem describes that confusing time in childhood before you can read or write. Without letters to pin down the words it’s so easy to get them wrong. Adcock recalls her mother offering her crayons and thinking she had said “crowns”. Learning to read brought her clarity but also sadness; all those words that had to be unlearned! It reminded me that when I was a child I thought that my mum carried a ham-bag and my grandpa was in the Gravy. I spent about a year playing “shoders” at nursery until “shoulder” and “soldier” resolved into two distinct words. Although it’s been a long time since I made those mistakes, my mum still clings onto my childhood words, offering me “noccit” when I visit home. My first impression as I enter Charlotte Square Gardens, the location of the Edinburgh Book Festival, is how solid the marquees are. It’s hard to believe that this world of bookshops, cafés, and theatres, populated by authors and readers alike, exists only temporarily. In a few weeks time I will walk by the empty square where I once heard some of my favourite authors speak and wonder where that world disappeared to. The first event that I attend at the Book Festival is a Meet the Author session with Kate Atkinson. A hush descends on the packed theatre when she walks in. She is introduced as a writer of novels with plots “fabulously intertwined in a way that only Kate Atkinson can make work.” This is why I love her books and I hope that today she will give us an insight into how she constructs such cleverly interwoven stories. The static-like sound of rain pattering on the roof of the marquee provides a soft background percussion as Atkinson reads aloud from her most recent novel, When Will There Be Good News? I am struck by how humorous the narrative is. Atkinson’s intonation and well timed pauses garner the audience’s chuckles. When I read the novel myself, I took it very seriously. It’s surprising how differently two people can interpret the same piece of text: it’s only now when I hear the words spoken aloud in the author’s own voice that I recognise the comedic moments that were there all along. The section that Atkinson reads from contains my favourite description from the novel: “Her left eye was bloodshot as if a red star had exploded in her brain.” I scribbled it down in my notebook when I read it the first time as a reminder of how I should aspire to write. After the reading, Atkinson discusses the novel with the light-heartedness of one who has let her creation go. It is in the domain of the readers now and she laughs as she confesses to have recently forgotten both the title of the book and the name of one of its protagonists. When asked about the characters in her novels, Atkinson begins: “People say the characters just spring into your mind, fully formed…” I hope privately that she is about to dispel this myth and tell us of the hard work that goes into creating such wonderfully realistic and flawed characters. Instead she continues, “And it’s true! The trick is making them work together.” At least she doesn’t claim that her characters speak to her and tell her what she should write. I’ve read so many interviews where authors admit to being bossed around by imaginary people that I’ve begun to worry that I won’t be able to write a novel until I start hearing voices in my head. It’s a relief to hear that Atkinson is firmly in control of her creations: “Your characters are your puppets. I enjoy manipulating them and making them do what I want.” Even Jackson Brodie is a “device” for binding together the multi-narrative, multi-character books that he features in, albeit in an ever-decreasing role. “He’s been demoted with each book and spends most of the third one in a coma, which says something about my attitude to returning characters,” Atkinson laughs. But fans of the Yorkshire hard man will be happy to learn that she is writing a fourth book where Jackson Brodie comes back stronger than before to revisit his past. She speculates that it will be published in 2010.